Peter Crossley-Holland achieved the occasional BBC broadcast during his lifetime but it was all rather low-key. An ethno-musicologist as well as a composer, I recall seeing a striking portrait of him cradling a South-Seas conch-shell horn. However there is none of that Californian or Pacific Rim flavour about this late symphony. In intention it is ambitious with four movements entitled Vision, Pilgrimage, In the Stream of Life and Offering. It is closest to Vaughan Williams in style but there is more to the work than that. Its profile is lyric and pastoral English although there's a light skim of Scottish accenting in the first movement. The music moves between the RVW of the Pastoral Symphony and the wide-West confidences of Copland and Roy Harris. There are occasional Baxian moments and later avian echoes of Moeran and Hadley amid a filigree of harp. The finale has the songful gleam of RVW's Serenade to Music complete with solo violin limning the way forward. It's a fine reflective symphony and ends with the confidence of serenity matched up against patent dramatics. The rest of the disc is occupied with an earlier generation who died in 1962. Eugene Goossens' Variation on Cadet Rousselle is his own very brief slice of a short composite song/work written by Goossens with Bax, Bridge and Ireland. This Goossens snippet is a sparkling upbeat piece with a Graingerian jauntiness decorated with that brilliantine joker, the xylophone. How long do we have to wait for recordings of Goossens' Phantasy Violin Concerto and the full-scale 1930s opera Don Juan de Mañara? The latter included a libretto by Arnold Bennett as did the other opera by Goossens, Judith. A John Ireland clutch - usually in arrangements by other composers - ends this well-filled disc. Merry Andrew should appeal to those who like the cheery face of Percy Grainger. The Bagatelle is skilful yet almost completely uncharacteristic. Its nonchalance reminded me of the Elgarian aspects of Ireland's cracking and crackling Epic March. Cavatina is a gloriously and soupily sentimental piece for solo violin. These are very early pieces - and it shows - though the results are really enjoyable in light-music terms; perhaps Ketèlbey would be an apt "soul parallel" here. Elegiac Meditation is a very late Ireland work written for organ but here arranged for string orchestra. It's touching and recalls the Concertino Pastorale. This is vintage attractive Ireland complete with a slightly viscous sentimentality which drifts close to The Londonderry Air. There's even a cross-echo of Forgotten Rite at one point. Lorraine McAslan gives a husky and throaty-toned solo in The Holy Boy. It's all so beautifully arranged by Christopher Palmer. The Holy Boy has had many arrangements. The final Two Salon Pieces are heard in arrangements by that master of light music, Leslie Bridgewater. Throughout, the redolence is of a sort of affectionate "Palm Court" gentility, in the gentle innocent manner of Elgar's Serenade and Wand of Youth and of early minor Delius. 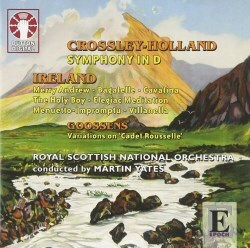 The imaginative Crossley-Holland orchestral vein has not been exhausted so do not be surprised if, one day, we hear evidence of this composer's symphonic poems (an unfashionable form) in the shape of Invocation at Midsummer, The Distant Isle, The Golden Pathway and The Land Beyond. These are promising titles to compare with the very different symphonic poems of Anthony Payne (NMCD037), Robin Walker and David Hackbridge Johnson. This disc of world premieres is most eloquently recorded and documented. It has been around for more than a few years but deserves to be noted.